Facts of Swedish Vallhund Dog, "Scientific name for Swedish Vallhund Dog, or domestic canine, is Canis lupus familiaris". "Fear of a dog Cynophobia". Swedish Vallhund Dog is said to have gone back of more than 1000 years in Sweden as the name suggests to the Viking days. There name was known as the (Vikingarnas Hund), the (Viking Dog). Between the 8th or 9th century, historians believed that either the Corgi was taken to Sweden or the Swedish Vallhund Dog was brought to Wales, the dog was first seen in Wales over 800 when the Vikings carried them into the country and this is were the breeding came from the two breeds. In 1942 the Swedish Vallhund Dog almost became extinct in Sweden. The Swedish Vallhund Dog is related to the Pembroke Welsh breed, Corgi Cardigan and the Welsh Corgi Dog. Some of the dogs breed talents included rattling, cattle driving and as a watch dog. The Swedish Vallhund Dog is a sturdy, low to the ground, small dog which has a muscular, long neck with a longer head than some of the breeds and a square-shaped muzzle from the side. The average height to the shoulders of the Swedish Vallhund Dog is 12 to 13½ inches (30.4 to 34.2 cm) and the average weight is 22 to 32 pounds (9.9 to 14.5 kg) Its head has oval-shaped, dark colored eyes which are medium in size. In addition to the dog’s black eyes, is the dark color of its lips and nose. The Swedish Vallhund Dog ears are firm from the base to the tip and mobile. The dog’s tail can be of varieties depending on different breeds. 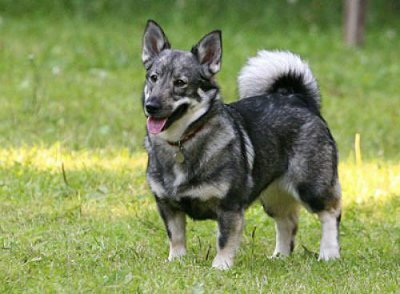 For example, a typical Swedish Vallhund dog can have either a stub, docked, bobbed or a naturally long tail. The dog has powerful short legs with oval-shaped, medium-sized feet which sometimes can have their Dewclaws removed. A Swedish Vallhund Dog sees in color and have better low light vision. Swedish Vallhund Dogs have three eyelids, a lower lid, an upper eyelid lid and a third lid, that is called a haw or nictitating membrane, this keeps the dogs eye protected and moist. Swedish Vallhund Dogs eyes have a special membrane for seeing better at night, called a tapetum lucidum - a dogs reflective layer in the choroid chiefly of nocturnal, causing the eyes to glow when light at night hits the eyes and they consist of some layers of smooth flat cells covered by a section of double deformed crystals. Swedish Vallhund Dog coat is harsh, tight, medium size in length on the outer with a soft denser coating underneath. The Swedish Vallhund Dog neck, chest and hind leg hairs are lightly longer than those covering the body. The coat can come in several colors like red-brown, gray, gray-brown and red-yellow. Swedish Vallhund Dog can also have white markings in small amounts. The dog has a well-defined stop and mask with lighter hair around the muzzle, underneath and around the eyes. A Swedish Vallhund Dog’s mouth can apply approximately 150 to 200 pounds of pressure per square inch and an American Pit Bull Terrier, German Shepherd Dog and a rottweiler can have 320 LBS of pressure on avg. The number one heath problems amongst Swedish Vallhund Dogs is obesity, so always make sure your dog doesn't get to fat. Many foot problems that Swedish Vallhund Dogs have are just an issue of long toenails. The Swedish Vallhund Dog is an affectionate, intelligent, even-tempered, responsive companion with a desire for attention and leadership. It is devoted and an extremely active dog. Swedish Vallhund Dog can bark aggressively and can be used as a rattling, herding or as a watch dog. It is expected to live for twelve to fourteen years. If purchasing a Swedish Vallhund Dog from a breeder, make sure to find a good breeder with references check at least two to three of the puppies that were purchased from this breeder. The Swedish Vallhund Dog belongs to Herding Group and in 2007 was recognized by the AKC American Kennel Club. A Swedish Vallhund Dogs can hear a sound at four times the distance of a human. Sound frequency is measured in Hertz (Hz) Def-Hertz is the measurement of frequency, explicitly it's one cycle per second. The higher the Hertz are, the higher the pitched the sound is. Swedish Vallhund Dogs hear best at 45,000 Hz to 65,000 Hz, while humans hear best at around 20 Hz to 20,000 Hz. Only humans and dogs have prostates, But a dog doesn't have an appendix. Swedish Vallhund Dogs have two times the amount of ear muscles than people. Swedish Vallhund Dog’s nose prints can be used to identify them, their nose prints are like a humans finger print. A Swedish Vallhund Dog smells more than 1,000 times stronger than that of a human. A Swedish Vallhund Dog’s nose, secretes a thin layer of mucous that helps it absorb scent, after that they lick their noses and sample the scent through their mouth. A Swedish Vallhund Dog is an omnivore, (definition-they eat both other animals and plants). all Dogs are direct descendants of wolves.